The morning’s first sunray slipped through the thin crack along the edge of Tillianita’s cozy wood-hollow, casting a faint sliver of orange into the shadowed recess above her feather-bed. At dawn’s first light, the hollow’s sole occupant began to stir. Shivering in the cool morning air, she wriggled deeper into the soft mound of feathers, muttering a few discordant notes of disapproval. The bright glow crept slowly down the wall, illuminating the hollow with ever-increasing brilliance. Simultaneously, the outside sounds grew louder, assaulting her tiny ears relentlessly. Tilly warbled a half-hearted comfort-song, but the unfocused magic sputtered ineffectively, so instead she covered her head with her arms, which helped not at all. The morning’s noises gathered in intensity. Outside her tree, birds called their morning greetings, squirrels chittered and played on the branches, and insects droned and hummed in the chilly air. Further away, but no less raucous, came the sounds of Man-things: engines, honks, screeches, and clanks, dulled by distance but still more than loud enough to reach deep into the Forest. And, infrequently but growing in number, the voices of Men joined the cacophony. Grumbling in frustration, Tillianita rolled over and poked her head out from under a cluster of thick white feathers, blinking in the morning light. She could silence the noise with a song and return to sleep easily enough, and might’ve done so another time, but not today. Since the last full moon the mornings had grown steadily cooler and the days gradually shorter. Today, she felt more than just a chill in the air. Faeries called it ai noi ta-ali, the Time of Transition, and it meant the end of one season and the beginning of the next. Autumn had arrived, and for Tilly, that meant no sleeping in. With some difficulty, the young faerie roused herself from the blissful warmth of her feather-bed. Standing squarely in the sunbeam, she sang softly, gathering in the lana-kai, the morning-magic. Gradually soaking up the scattered wisps of energy, she soon felt invigorated. The last vestiges of sleep faded quickly, and after a few minutes, she found herself fully awake. Tillianita stretched and slipped into her spidersilk body-cloak, which set her skin to tingling. The thin garment would keep her warm, but not completely, especially if the winds picked up. Focusing carefully, she began another comfort-song, this time taking care to get the notes just right. The morning’s chill melted away, and the obnoxious Man-noises faded to a distant whisper. She had lived with those sounds all her life, finding no refuge from them anywhere, so she dealt with them as best she could. Man’s creations surrounded the Land, after all. Even in the deepest heart of the Forest, she could find no solace. Men came and went as they pleased, intruding on every corner of the Land, even traveling across the water on strange, unnatural contraptions. A solid black river of crushed stones surrounded the Land, upon which countless metal monstrosities roamed both day and night. Beyond these, immense towers rose skyward, encircling Tillianita’s Forest home in all directions. Her sire, Torrialanthar, once told her (in one of his seemingly innumerable stories) that long ago Men raised those towers using great shana-kai, the unfathomable magic only they could wield. Before that, or so Torrialanthar claimed, all the world was Land. Tillianita, naturally, had her doubts. She loved her father dearly, despite everything, but as she grew older she had to wonder just how many of his fanciful tales were naught but legend. Men did indeed command the shana-kai, which she knew from experience had power, but could it really spawn such massive spires? They stretched taller than she could ever hope to fly, often touching the very clouds themselves, and could survive even the strongest windstorm. Still, they weren’t invulnerable. Her sire once spun a wild tale of the day when two of the most distant towers vanished within clouds of smoke, never to be seen again. Torrialanthar didn’t speculate on the cause of this calamity, but the Men were definitely affected, for they changed their habits dramatically. For days, fewer came into the Land, and those who did seemed sad and distracted. In time things went back to normal, but the towers never returned. Sometimes, on clear autumn nights, while perched in the highest treetop she could find, Tilly thought she could see faint lights shining up where those spires once stood, but couldn’t be sure. Ghosts, perhaps, as her father might say, in one of his famous bedtime stories. Or perhaps just the runaway imagination of a single lonely faerie, staring out at the distant world of Man. Tillianita sighed and completed the comfort-song, just as the sunray reached the halfway point along the wall. The song would last only a little while, but long enough for the day to warm up on its own. Lana-kai, strongest of the day’s energies, was also the most fleeting and capricious. Some days she could barely contain its power, but in its wildness it would last but mere moments. Today, with the magic more subdued, she could be more creative, if she wished. She did, of course. Tillianita had a job to do, but not just yet. The days were still long enough to get done what needed doing. She could afford to indulge just a little bit. A few quick notes slid her dwelling’s single entrance, a heavy door of solid wood, open enough for her to emerge into the chilly morning air. She took a moment to survey the Land far below, which looked much the same as always. Numerous tall trees, including the majestic elm that served as her home, surrounded a path that wound its way through a few gently rolling grass-covered hills. Black metal posts lined the trail, their white tops still glowing with unnatural shana-kai that would soon fade away. Somehow the Sun triggered them, in a way no faerie could hope to understand. The lights were cold and lifeless, but Man had mastered their magic completely. Tillianita flexed her iridescent, blue-tinged wings, letting them quiver and flutter a few times in the faint breeze. A few birds called in greeting and she answered with notes of her own. With easy grace she walked along a thin branch until it grew so thin it bent beneath even her slight weight. From here, she could see a wide portion of the path perhaps twenty feet below, unobstructed by leaves or other branches. Along the trail the Men passed by, still sparse in number for now, as was usually the case this early in the day. Later they would grow more numerous, but for now Tilly saw only a few. Some walked, while others ran with a slow, loping gait, mostly remaining on the path. More rarely, one might skate along at higher speed, weaving back and forth, wearing round things on his feet. This seemed a faster mode of travel, yet only a few Men did this—perhaps a sign of greater status, or a game they played among themselves? Tillianita had no idea. The ways of Men were most befuddling. She watched them for a few minutes, hoping for just the right specimen to pass by. First, a tall male jogged past, his body wide and slow, brow covered with dripping moisture. Next, a pair of elderly females limped along, jabbering among themselves like birds arguing over a nesting site. Two equally old males approached from the opposite direction, stepping aside; one raised his headgear for the others, which made them cover their mouths and laugh. Behind these came another, and still another, on and on in a seemingly endless flow of Men. Sometimes, if she watched carefully enough, Tillianita could identify specific individuals among the crowd. That one there, for example, she thought with a smile. The skinny male with dark hair cut short everywhere except in back, where it formed a ponytail that bobbed up and down with every step. She saw him at dawn nearly every morning, regardless of the time of year, even in pouring rain or heavy snow. And that male coming the other direction, too. Heavyset, with a thick white band tied about his balding head, his gray hooded sweatshirt already drenched with moisture…not nearly as consistent a visitor, but she saw him every other day, or thereabouts. Oh, and what would a morning be without the withered elder with the curiously flattened hat, limping gait, and snow-white hair that nearly matched her own? She spotted him walking slowly along the path’s grassy edge, taking his time unlike so many others, curved balance-stick in one hand and dog leash in the other. Tillianita flexed her wings, stepped forward, and took to the air. The chilly breeze caught her at once, lifting and twisting her this way and that, but she reacted instantly and without thought. For a faerie, flight was as natural as walking, so spinning into a gracefully curving dive toward the ground took no effort at all. She brought herself into a hover before the old man’s dog, Nurfurlig, who instantly ceased nosing about along the wall’s perfectly manicured edge and cocked her head in the faerie’s direction. “So it would seem,” replied Tillianita with a nod, wrapping her arms about her shoulders as she glided slightly higher in the air, allowing the dog to pass underneath and nose about the wall for new and interesting smells. The faerie watched in silence for a moment as Nurfurlig went about her business, paying no further heed to the tiny hovering faerie. Unlike most other creatures, dogs willingly lived alongside Men, sharing their lives and consenting to their master’s will, protecting and serving him in exchange for food and shelter. A fair bargain, or so her sire always said, though Tillianita never quite understood such a sacrifice. She knew she wouldn’t be able to give up her freedom quite so easily. Within moments the dog completely forgot about Tillianita. Dogs communicated with each other mostly by smell, so in sniffing along the wall just so, Nurfurlig basically read the dog-news of the day. She would likely never meet most of the animals whose messages she smelled amid the cracked bricks and neatly trimmed bushes along the wall’s edge, but Nurfurlig nevertheless knew those others all quite well, in a way Tillianita never could. The little faerie frowned and fluttered higher into the air, alighting on a nearby branch as she watched Nurfurlig nose her way from tree to tree. For an animal to so willingly serve Man seemed counter to all Tillianita understood about the world. She knew that with a simple song she could release the hound to run freely into the Forest, if it so wished. In her younger days she tried this more than once, but to her surprise, dogs never fled, but always obeyed their master’s call. Dogs didn’t want freedom, it seemed, but preferred to stay with Men of their own volition. She knew the reason, of course, if her sire’s tales were to be believed. Tillianita sighed as the uncomfortable memory resurfaced. Thinking about Torrialanthar set her heart to aching, but she couldn’t help herself. Try as she might, she couldn’t quite put him out of her mind. Without realizing it, she softly began to hum, and soon the notes of a shaping-song escaped her lips, drifting out into the cool morning air. She remembered the tale quite clearly. Still but a child, nestled among the soft down-feathers deep within the wood-hollow, she remained awake well after sunset. Her father, tall and lean, smelling of lilac and cherry blossom, checked in on her after returning home late, and upon finding his younger daughter’s eyes wide open, smiled and settled down beside her. Whenever she couldn’t sleep, Torrialanthar always told her a story, usually related to the day’s events. Earlier that afternoon he caught her trying to free a dog from its master, and put a stop to her pitiful efforts. She couldn’t understand why the dog wouldn’t flee, so her sire explained as only he could, with a long-winded story-song, fanciful and bombastic, but with just enough of a grain of truth that she had to wonder, even now, if he was right. There was a time, my young Tilly (or so he always called her, abbreviating her name to but a single note of faerie-song) when Men were not so numerous as now, and the Test of Ice still wracked the world. In those days tribes of Men roamed the Land, hunting to survive, and often being hunted themselves. One such enemy was the wolf. A lone wolf stood little chance against such foes, but in groups they reigned supreme. Men hated wolves for this and destroyed them whenever they could. One day a group of Men discovered a nest of wolves, hidden in a snow-cave. The she-wolf attacked, defending her young, and quickly fell before their weapons. Then, as was their way, the Men commenced to digging out the pups. The helpless young were no match for the spears of these hunters, who fell about their grim business with little mercy. Yet as he went to slay the last, one of the Men looked down at the pleading eyes of that baby wolf and hesitated, if only for a moment. Before the Man could decide whether or not to complete his task, a great beast stormed into the midst of the group, trampling and slaying many before they finally brought it down. The survivors gathered what meat they could, taking it back to their tribe and leaving their fallen where they lay, including the Man who hesitated. He was not dead after all, but awoke hours later, gravely injured, to find the wolf pup licking his wounds. The Man dragged himself into the snow-cave and warmed himself there while the pup fed upon the remains of the great beast. Over many days the Man regained his strength, venturing forth occasionally to claim his share. The wolf pup also grew stronger and larger, and had every occasion to tear out the Man’s throat, yet did not do so. Finally the Man felt strong enough to travel, yet a storm stayed his hand. He would wait one more night, and then attempt to return to his tribe. The wolf, a pup no longer, wondered what he should do. Travel with the Man, or attempt to survive alone? The great beast’s carcass was no more. From this point forward he would have to hunt on his own. With no mother to teach him the ways of the hunt, and no pack to run with, he felt lost and alone, except for the Man. The wolf felt uncertain, unsure of himself—but the decision must be made upon the morrow. During the night the storm ended and the full moon rose. The young wolf, sleeping by the Man’s feet, awoke to a loud, unearthly howl. He left the cave to find the Black Wolf standing there, dark as midnight and bigger than any wolf ever born into the world. Immediately the youngling yelped and bowed his head in deference to his superior. “I would,” the young wolf answered firmly. The Man emerged from the cave then, but of course not the true Man, only his dream-form. “What would you want with me, O great Black Wolf?” he asked, for in dreams all creatures speak alike, and recognize the true forms of one another. “Just so,” said the great wolf without hesitation. And with that he howled once more and vanished into the wind. The Man awoke the next morning with the memory of the dream and went home, with a young wolf at his side, and upon hearing how both had saved each other’s life, the tribe allowed the wolf to remain. The two became great hunters, for together they were much more than they would be alone; and one day the Man became chief of his tribe, and as time passed more and more wolves agreed to the bargain. Yet the Test of Ice changed much of the world, not only in shape and form but in those who dwell within it. By the time that terrible trial had ended, those wolves who sided with Men had become dogs, while those who did not remained wolves, as it was agreed all those many seasons ago, and even today the bond between a dog and his Man cannot be broken. Tillianita’s shaping-song ended and the memory, as sharp and clear as if it just happened, faded like the morning mist upon the breeze. The thought-shaping created nothing that didn’t already exist, simply reinforcing latent memories and feelings she had always held within her heart. For that one brief moment Tilly felt comfortable and fulfilled, a happy youth drifting off to sleep at last as her father spun his tale. Now that pleasant sensation slipped away, and the dark emptiness returned. No! Not again! Not this time! She insisted to herself. Just for once, I’ll try to spend a whole day without thinking about him, or the others. The best way to do that is to get to work. Tillianita still had one thing she wanted to do first. Her sire never approved of this particular use for spidersilk, and punished her for it on more than one occasion. Without him to stop her now, she indulged herself whenever she could gather enough lana-kai. Today’s bounty proved more than sufficient. Sometimes she could tarry quite a while for just the right subject to pass beneath her wood-hollow home, but now she no longer felt like waiting. Instead she took to the air, slowly at first, and gradually easing up to full speed. As quick as any bird, she zipped along above the walking path, darting back and forth to examine the Men who traveled there. Though she passed quite close, they took no notice of her at all. Within the confines of the Land, she could pass unseen by most. 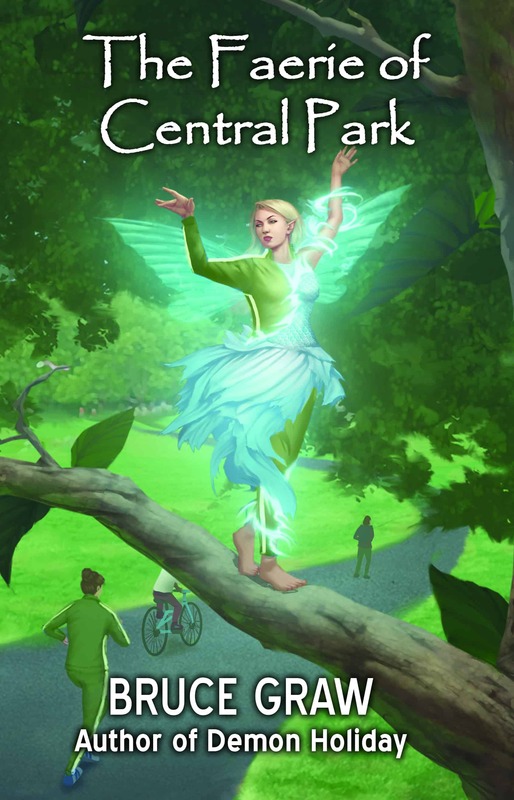 Tillianita flew higher, and within moments found what she was looking for—a dark-skinned female, dressed in bright, fanciful clothing, jogging slowly along the path. About her head she wore a strange malika, or Man-thing, that played incomprehensible music-like tones directly into her ears. The woman ran swiftly past, oblivious to everyone and everything, and Tillianita followed, humming softly to herself. Her song gathered in strength, sweeping up more of the morning’s lana-kai, the gift of the Land that, like faeries themselves, couldn’t be seen by Men. With practiced skill she worked the magic into her body-cloak, changing it a little bit at a time until it tightened all around, covering every inch of skin. The normally pearl-white outfit became bright blue, with black and red stripes along the sides, a miniature duplicate of the female jogger’s running suit. Tillianita continued the song, the piping notes sounding in time with the woman’s heavy footfalls, until even the copied shoes and socks matched perfectly. Only the earphones about her head, their purpose unfathomable to the little faerie, remained missing from the ensemble. Tillianita finished the silk-weave song and hovered for a moment, studying the look and feel of the copied bodysuit. The body-cloak hadn’t really changed, just taken a new form for a while, but it felt wonderful. Clinging so tightly to her body, the altered cloak would no longer slow her in the wind, or catch upon a branch or leaf as she darted back and forth among the trees. Plus, its bright colors would make her stand out among the Land’s other denizens and draw attention to herself, a feature she definitely needed today. She might not understand Men at all, but their strange clothing definitely had its uses. For the briefest instant Tillianita wondered what her father would say if he returned this very moment and saw her thus attired. He’d be furious, of course, but she didn’t care. She liked it, and this was her choice to make, after all. She could make her own choices now—he made that abundantly clear when he took his leave. She shook off that unpleasant thought. No more thinking about him, she insisted to herself, zooming off to start the day. The bird, a blue-and-white thrush of a type quite common in the Land, skirted the ground and deftly plucked a buzzing insect from the air, just before it could alight upon a yellow flower. With a quick snap of its head, the eastern bluebird swallowed its lunch and swooped upward, landing on a low-hanging branch, which swung radically back and forth with the added weight. Tillianita alighted nearby, smiling and waiting for a response. The bird bobbed up and down for a moment. She could sense its reluctance. Birds like this had little choice but to migrate, if they wanted to survive, but that didn’t mean they had to like it. If left to themselves, they’d procrastinate themselves to death, she knew. Best to get them on their way. Yet it would take a lot of work, especially if all of them were as reticent as this one. True, the first frost had yet to fall, but it wouldn’t be long in coming. She could feel that, deep inside, though she couldn’t tell how. She just knew. The bird agreed at last. “I’ll tell the others,” it replied with the avian equivalent of a sigh. In a flash it was gone, swooping down across the grass, toward more flowers and other insects to eat. As it flew, it sang, calling out in the chirps and tweets that made up its particular language, and the other birds would hear the message. Most wouldn’t heed it, of course. There would be much arguing and loud counter-chirping, but with Tillianita’s help, more and more would be convinced. Then, they would slowly come together, in growing groups, one by one, until enough were gathered to make a flock, and then they would head south, toward warmer places, just as they did every year, no matter how much they might complain about it. Sometimes, Tillianita wished she could go with them. Oh, she could, of course, if she really wanted to. She could leave, just as her family had. Any of these birds would be happy to carry her on its back, flying over the walls and the towers…beyond the Land that was the only home she’d ever known. There was more Land out there—there had to be, or the birds would have nowhere to go—but it wouldn’t be the same. It wouldn’t be her Land. She couldn’t go. She knew she’d never be able to leave. Her Land needed her, and she needed it, too. As long as she remained, she’d protect it as best she could, even from Man, if she must. That was her duty, her very reason for being. That’s why she was here. So why am I so unhappy…? The thought came without warning, as it often did in quiet moments like this, when she sat alone looking out at some tiny fraction of her home. The last of the late-summer insects buzzed around her, and hungry birds sang all around. From the distant paths came the ever-present sounds of Men, lost in their own private errands. She wasn’t happy anymore. She knew this truth quite well, but hadn’t really accepted it, at least not completely. For a long time, she’d blamed her faint but ever-present depression on loneliness, and sometimes boredom, but most of all on her father. She was angry at him, of course, but in time she’d grown to accept his reasons for leaving, even if she didn’t agree with them. Even so, his absence left a hollow, empty feeling in her heart—a void that time and constant work had eventually filled. For a while, perhaps, she’d felt better, but no longer. She was just…well, she wasn’t sure exactly how to describe her emotions—perhaps a bit of loneliness, and boredom, and resentment all rolled up into one. Whatever the cause, she found herself unhappy, and caring for the park, while necessary and important, just didn’t help anymore. To make herself feel better, she often sought out distractions, more often than not involving Men. They were everywhere, always doing something interesting, no matter the weather or the season. Sometimes she’d make a game of it, trying to guess what one or another of them was up to, or perhaps trying to mimic whatever they might be doing. Often they did strange, pointless things, like throwing flying discs or balls through the air, or racing along on strange contraptions very quickly, as if in a great hurry. She knew this odd behavior had to be some kind of game or hobby, just like Man-watching was to her. Tillianita sighed and let herself slip off the branch, fluttering out toward the center of the pond and rising slightly into the air. The northeast wind caught her then, carrying her back the way she came, but she leaned forward and pressed on, advancing toward the farther reaches of the Land. Sitting around worrying and fretting over her own problems wasn’t going to help the Land prepare for winter any faster, after all. She had a job to do, and that was more important than anything else. Besides which, she told herself, if I get enough done today, I can reward myself with a little leisure time later. Perhaps that’ll help. Maybe this strange depression just has something to do with the change of seasons. A few games later on, just before sunset, will surely do the trick. Thus convinced, she pushed her way on through the stiff headwind, eager to finish as early as she could. The Sun had nearly touched the horizon, but the winds hadn’t yet slowed, as they often did when the day drew to a close. Tillianita alighted on the top of the Land’s eastern wall, glad to have some respite from the endless breeze. She found herself quite weary from the day’s work, especially when she had to journey up the high hill to the north, for the wind proved strongest there. The area atop the rise was the most vulnerable to winter’s touch, of course, so she had little choice but to make the challenging journey. Her wood-hollow remained some distance away, on the other side of the Land’s vast central lake, but getting home would be a simple matter. Staying low, she could avoid the worst of the winds, which would surely lessen after nightfall anyway, so she saw no reason to hurry. Instead, Tillianita rested for a moment and looked out at the meadow, paying no heed whatsoever to the noisy vehicles passing by behind her. Ahead, several Men engaged in a strange ritual she’d witnessed many times but never understood. They would launch strange, wing-like contraptions into the air, holding onto them with long strands of twine as they danced and soared overhead. Often, as now, many Men would gather to do this, running back and forth across the field, struggling to control their artificial wings as they strained against the breeze. Tillianita smiled at the recollection. She no longer feared the air after that, did she? Yet her endless questions drove her father to distraction. He told her the devices used ithil-kai, wing-magic, in the same way as birds and faeries, but the Man-wings weren’t alive, like other creatures of the Forest. Instead, they were things he’d created out of wood and woven plant-fibers. Why Men made the wings, and launched them so high in the air, Torrialanthar had no idea. After that day, Tillianita scarcely rested until her own wings were strong enough to carry her high enough to see the Man-wings for herself, but doing so brought no answers, only more questions. Those were simpler days, when her duties were few and she could explore and wonder with the eagerness of youth. Now, as she watched the half-dozen humans at play in the meadow, Tillianita recalled her earlier promise to herself. She’d worked hard all day, and now she could enjoy some leisure time before returning to the wood-hollow and a welcome night of well-earned rest. What better way to have some fun than to join the Men in their wing-flying ritual? Bracing herself against the wind, she took to the air, soaring up into the reddening sky. The winds were stronger here, but she was determined, and soon she’d reached the first of the Man-wings, an elongated diamond made of fabric stretched over a framework of thin wood. She’d seen such things before, and knew what to expect, but as to why Men created them, and how they used ithil-kai without flapping, she still had no idea. That didn’t mean she couldn’t enjoy them, much as the Men below clearly did. By simply moving back and forth, they could make their wings swoop and dart about. Singing happily, Tillianita joined in, matching their unpredictable movements as best she could. If she stayed as close as possible, she could keep within the pocket of quiet air just behind the Man-wing, where it blocked the wind. Of course, in doing so she lost sight of the Man below, making it impossible to tell where he might move to next. That’s what made the game so challenging! Each Man-wing differed from its fellows, depending on the shape. Some formed wide air-pockets of almost complete stillness, while others created miniature vortexes that spun her round and round. Laughing, she experimented with each one, leaping and spinning from one wing to the next, until finally she felt the weariness catching up to her. The long day had nearly ended, the Sun all but gone behind the distant line of buildings to the west. Down below, the Men were already reeling in their kites, although a few yet remained. Tillianita coasted to the nearest, a wide arrow-shape that made a comfortable air pocket to rest in, and settled upon its tip to catch her breath. The Man below seemed tired, too, for he reclined upon the ground, holding the line steady, so the fluttering wing-arrow remained stable. In due course he would summon it to him, but for now, she could enjoy a quiet moment, high above the Land. Tillianita peered out over the peaked front end of her perch, taking in the view. The last curved edge of the orange Sun slipped below the edge of the Land, lending the clear sky a striking reddish glow. A single thin line of pink clouds hovered over the treeline, as if to mark the boundary between earth and sky. She could see the entire Land, its summer green flecked here and there with streaks of brown and tan, where the trees had already started their autumn transition. Sparrows, warblers and thrushes swooped everywhere below, singing as they darted about, catching their fill of insects. Amid the random chatter, Tillianita caught a few hints of what she’d hoped for—they were discussing the coming migration. She smiled, relaxing her weary wings, glad for the chance to rest, and pleased to learn her advice hadn’t gone unnoticed after all. She still had much to do, for the seasonal transition would take time, but for now, she was satisfied with her progress. In that one brief moment, as dusk fell over the Land, and the world seemed to be at peace, the exhausted little faerie was content. Then the kite string broke. For a few seconds Tillianita couldn’t catch her breath. Upon being freed of its sole link to the ground, the Man-wing celebrated by soaring straight up into the air. The unfortunate faerie found herself launched skyward, caught up in the ridges along the edge, unable to let go or even move. Her wings, flattened out along her back by the sudden rush of motion, couldn’t even manage a weak flutter. The wind shifted then, and for an instant the Man-wing stabilized, hovering, as if deciding what to do next. Tillianita didn’t hesitate. In an instant she darted away, wings beating furiously as she shot upwards, instinctively avoiding the easy path of flying with the wind, for that’s where the wing would surely go. Nor was she mistaken, for an instant later the arrow-shape swept past beneath her, beginning its inevitable descent. She hovered as best she could, gasping for breath, watching as the Man-wing spiraled away, banking down, down, down, finally disappearing into the branches of one of the trees along the edge of the Land. She gasped again. The trees below were nowhere near the meadow! How far had the errant wing borne her? All the way across the Land, it seemed, and further still, for as she watched in horror, the ground below slid past at a dizzying rate. The winds, even stronger here, pushed her relentlessly to the northwest. She was high now—higher than she’d ever dared to fly. Nowhere near the level of some of the great towers, of course, but far too high for comfort. Already she could feel the onori-kai—the evening-magic—slipping away. Her comfort-song, renewed regularly throughout the day, faded quickly now, leaving her shivering in the chilly evening wind. Ignoring the sudden cold, Tillianita dove down, trying to angle toward the Land’s nearest border, still visible in the twilight. To her dismay, she saw she wouldn’t make it. The wall stretched out ahead of her now, and the winds tore at her as she struggled. She felt her body growing heavier and heavier as she descended, getting weaker with every passing moment. Then they would do to her what they did to her sister, Nithalinni, all those summers ago. And without a faerie to tend to it, what would become of the Land…? Tillianita couldn’t let that happen. The Land needed her! She closed her eyes, gritted her teeth, and fought with all her might. Lower and lower she fell, battling the wind, until she could take no more. Spent and exhausted, she opened her eyes, hoping beyond hope she’d reached the wall, and had somehow reached her home. She came down over the street. Just below, hordes of metal-beasts, the mindless not-creatures that existed only to do Man’s bidding, filled the air with noise and smoke. She’d drifted far too low, and only now, as she hovered near collapse, did Tillianita realize her peril. Terrified, she turned to see an immense gray shape approaching rapidly, blotting out the horizon. With a cry of panic, she struggled to gain altitude, wings beating furiously behind her. With every ounce of will she possessed, she forced herself to climb above the looming monstrosity. As the truck raced by just inches underneath her, its draft sucked her along, spinning her frail body out of control. She let out a single, high-pitched note of terror as she bounced once off the back of the vehicle, then fell, her wings beating ineffectually as the street reached up to claim her. Then something red and shiny crossed her path. She struck it, rebounded upward for an instant, rolled, and came to a stop. For an instant she saw her terrified face reflected back at her, and then all went dark. This product is available for preorder here.